Every one of his Antarctic expeditions ended in failure. His life "off the ice" was a series of failed get-rich-quick schemes. 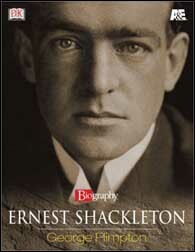 And yet the name of Sir Ernest Shackleton (1874-1922) remains a byword for charismatic leadership, raw courage, and endurance in the face of overwhelming odds. Perhaps the greatest hero of the heroic age of polar exploration, Shackleton's crowning achievement was to bring all 28 of his men home safely after their ship was crushed in pack ice in 1915 - an epic journey capped by an 800-mile small-boat voyage through some of the planet's roughest waters. In Ernest Shackleton, writer and media personality George Plimton not only tells Shackleton's story, but recounts his own recent adventures following Shackleton's footsteps through the bleak, beautiful seas and islands at the bottom of the world.